With ownership of a recreational vehicle comes the freedom to explore the country and the opportunity to make memories with your family and friends. It also comes with the responsibility of finding a place to store it when you’re not off on an adventure. While some individuals can keep their RV on their home property, a storage facility can provide an effective and affordable solution for nearly all RV owners. Protection from damage. Although RVs are outdoor vehicles, any RV that’s parked outdoors for a long period of time can begin to show signs of damage. High humidity, extreme hot or cold temperatures, rain, hail, and other environmental factors can take a toll on a vehicle. Vines Storage can protect your vehicle from the elements and from small rodents when it’s parked. Security. Often RV facilities offer greater security than most individuals have at their homes. Vines Storage is gated, fenced, has a key code entry and has plenty cameras to ensure extra protection for your investment. More room to move: Unless you live on a large parcel of land or have a very wide driveway, you might find that keeping an RV at home makes it hard to park or move other vehicles around it. Furthermore, some neighborhood and home owners’ associations strictly forbid parking an RV on your street or in your driveway. Convenience: Storage facilities that house RVs are often created with RV owners in mind. At Vines Storage, you’ll find amenities such as a dumping station, compressed air, and an ice machine on site so that you don’t have to make an extra stop at the beginning or end of your trip. Flexibility: Just like no two RVs are the same, the storage needs of RV owners vary widely as well. 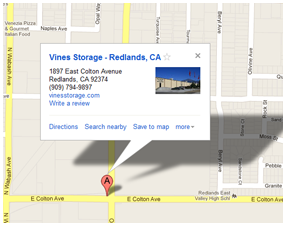 Vines Storage offers small and large units, indoor and outdoor units, and short or long-term leases. Our team will work with you to ensure that you get the RV storage solution that you need. For more information about parking your RV at Vines Storage, call or stop by our conveniently-located facility today.